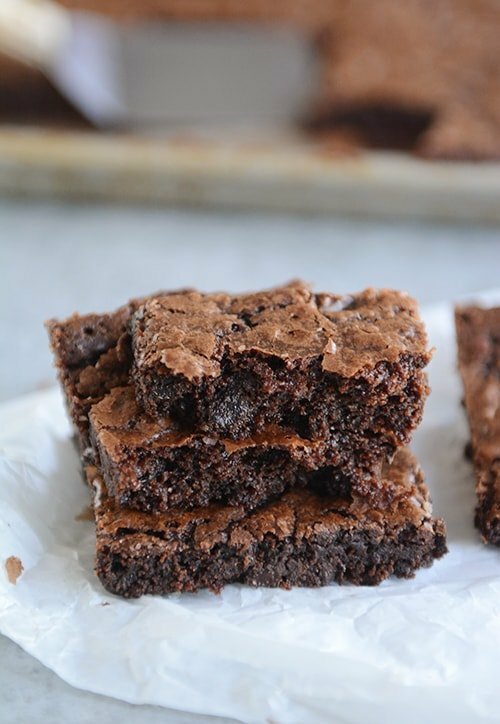 Since I totally left you hanging last week for new, tasty Memorial Day eats (a million excuses, you don’t want to hear them), consider these sheet pan brownies my penance. Even if you have plans today to party like it’s 1999 (or in other words, have a BBQ), these decadent, fudgy, rich brownies can still fit into your schedule thanks to their quick and easy, no-fuss prep. Of course, if you’re me, it doesn’t matter what kind of brownie recipe it is, you and I can always find a way to fit it into our schedule. I should warn you, though, if you think it might be fun to try one of these straight out of the freezer, you better high tail it to the Land of Self-Control, because the deliciousness of a bite-sized, chewy, chocolatey brownie piece from the cold depths is insane. And if you think I stop at just one bite-sized piece, you clearly don’t know where I live (hint: it’s not in the Land of Self-Control). The moral of this story is: these sheet pan brownies are amazing. Make them for a crowd. If not, don’t blame me, because you’ve been warned. Goodbye.